FLOMY PLUS COVER. Covers mite. They are made with high quality fabric (60% Polyester + 40% polyurethane). Constitute a barrier to dust mites and their allergenic particles. Its innovative fabric provides: - Water vapor permeability, facilitating the body perspiration, preventing moisture buildup and increasing user comfort. - A perfect elasticity, avoiding the formation of wrinkles in the fabric and getting a perfect fit to the mattress or pillow. In addition, the sleeves provide additional protection Flomy since: - Prevent the growth of bacteria on its surface due to antimicrobial treatment Bio-Pruf ®. 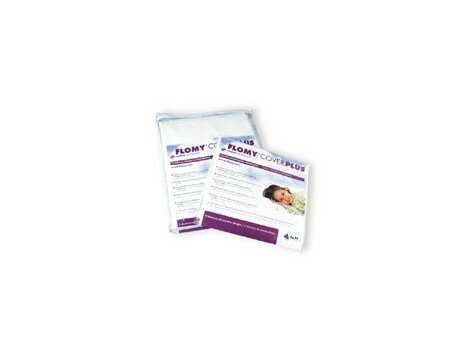 - Your material ensures full coverage closed and sealed the mattress and pillow. - The material used is flame retardant. Studies in our R & D laboratories have shown that tissue Flomy Plus Cover material prevents the passage of mite allergen. However, the passage through tissue CONTROL (cotton commonly used for making pillows, sheets and liners) is very high.